to improve the organization and quality of our search results. Sitelinks are the two columns of links that appear under some search results and ads that help users easily navigate deeper into the site. Sitelinks haven’t changed fundamentally: they’re still generated and ranked algorithmically based on the link structure of your site, and they’ll only appear if useful for a particular query. Visibility. The links have been boosted to full-sized text, and augmented with a green URL and one line of text snippet, much like regular search results. 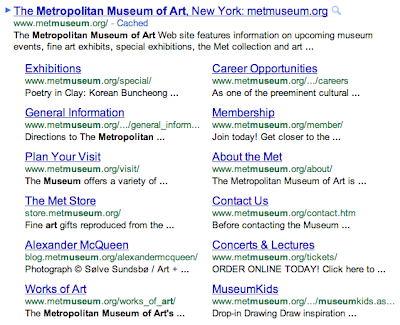 This increases the prominence of both the individual sitelinks and the top site overall, making them easier to find. Flexibility. Until now, each site had a fixed list of sitelinks that would either all appear or not appear; there was no query-specific ranking of the links. With today’s launch, sitelink selection and ranking can change from query to query, allowing more optimized results. In addition, the maximum number of sitelinks that can appear for a site has been raised from eight to 12, and the number shown also varies by query. Clarity. Previously, pages from your site could either appear in the sitelinks, in the regular results, or both. Now we’re making the separation between the top domain and other domains a bit clearer. If sitelinks appear for the top result, then the rest of the results below them will be from other domains. One exception to this is if the top result for a query is a subpart of a domain. 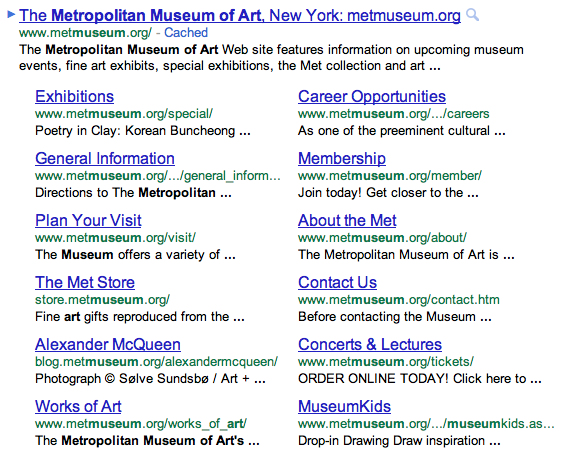 For instance, the query [the met exhibitions] has www.metmuseum.org/special/ as the top result, and its sitelinks are all from within the www.metmuseum.org/special section of the site. However, the rest of the results may be from other parts of the metmuseum.org domain, like store.metmuseum.org or blog.metmuseum.org/alexandermcqueen/about. Quality. These user-visible changes are accompanied by quality improvements behind the scenes. The core improvement is that we’ve combined the signals we use for sitelinks generation and ranking -- like the link structure of your site -- with our more traditional ranking system, creating a better, unified algorithm. From a ranking perspective, there’s really no separation between “regular” results and sitelinks anymore. These changes are also reflected in Webmaster Tools, where you can manage the sitelinks that appear for your site. You can now suggest a demotion to a sitelink if it’s inappropriate or incorrect, and the algorithms will take these demotions into account when showing and ranking the links (although removal is not guaranteed). Since sitelinks can vary over time and by query, it no longer makes sense to select from a set list of links -- now, you can suggest a demotion of any URL for any parent page. Up to 100 demotions will be allowed per site. Finally, all current sitelink blocks in Webmaster Tools will automatically be converted to the demotions system. More information can be found in our Webmaster Tools Help Center. It’s also worth mentioning a few things that haven’t changed. One-line sitelinks, where sitelinks can appear as a row of links on multiple results, and sitelinks on ads aren’t affected. Existing best practices for the link structure of your site are still relevant today, both for generating good quality sitelinks and to make it easier for your visitors. And, as always, you can raise any questions or comments in our Webmaster Help Forum. This week we launched an update to sitelinks to improve the organization and quality of our search results. Sitelinks are the two columns of links that appear under some search results and ads that help users easily navigate deeper into the site. Sitelinks haven’t changed fundamentally: they’re still generated and ranked algorithmically based on the link structure of your site, and they’ll only appear if useful for a particular query.